Now that flexible display are starting to appear, there are still many obstacles towards bendable devices. One area in which several companies are advancing is flexible batteries. Earlier this month we reported about LG Chem curved and cable batteries, and today we learned that Japan's SEL is also developing similar technology. SEL are showing a prototype Li-Ion rechargeable battery at the FPD International 2013 event in Japan. SEL explains that they have been developing this technology for a long time but they finally show it now as demand for flexible and wearable devices is starting. 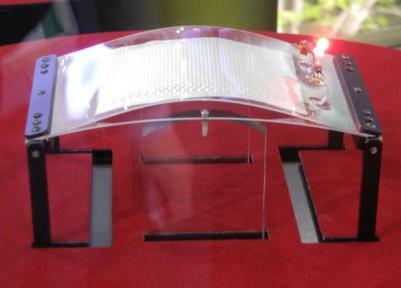 The battery on display is 50x40 mm in size and 1.6 mm thick. The capacity is 300 mAh and it can be bent bent to a curvature radius of 40mm. Even after 10,000 bending, the properties do not deteriorate.